The death of character resulted from the working of large historical forces that had “little to do with individual moral failure.” This is the story told by James Davison Hunter in his important study of recent attempts at moral education, The Death of Character: Moral Education in an Age Without Good or Evil. The story told by Richard Weaver in Ideas Have Consequences pushes the origins of the demise of character back to the 14th century. It began with the rise of “the fateful doctrine of nominalism,” best represented by the work of William of Ockham. Nominalism holds that there are no universals. The issue ultimately involved is whether there is a source of truth higher than, and independent of, man; and the answer to the question is decisive for one’s view of the nature and destiny of humankind. The practical result of nominalist philosophy is to banish the reality which is perceived by the intellect and to posit as reality that which is perceived by the senses. With this change in the affirmation of what is real, the whole orientation of culture takes a turn, and we are on the road to modern empiricism. It is easy to be blind to the significance of a change because it is remote in time and abstract in character. Those who have not discovered that world view is the most important thing about a man, as about the men composing a culture, should consider the train of circumstances which have with perfect logic proceeded from this. The denial of universals carries with it the denial of everything transcending experience. The denial of everything transcending experience means inevitably—though ways are found to hedge on this—the denial of truth. With the denial of objective truth there is no escape from the relativism of “man the measure of all things.” The witches [in Macbeth] spoke with the habitual equivocation of oracles when they told man that by this easy choice he might realize himself more fully, for they were actually initiating a course which cuts one off from reality. Thus began the “abomination of desolation” appearing today as a feeling of alienation from all fixed truth. Partly right, partly wrong—that’s how we’d have to judge Weaver on this prediction. Right about the amoral prediction but wrong about the inability to see it. In 1997, just forty-nine years after the publication of Ideas Have Consequences, political science professor John J. Mearsheimer disclaimed morality as part of the University’s vision in a welcoming address to incoming freshmen. The 1997 Aims of Education address by Dr. John J. Mearsheimer, R. Wendell Harrison Distinguished Service Professor of Political Science at the University of Chicago, is available online. James Davison Hunter’s The Death of Character: Moral Education in an Age Without Good or Evil was published by Basic Books (2001). Dr. Robert Preston’s very helpful retrospective of Richard Weaver’s Ideas Have Consequences, “A Man of Vision,” was published in the November/December 1998 issue of Touchstone Magazine. 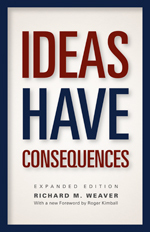 The Introduction and Chapters 1 and 2 from Ideas Have Consequences are available online. The book may be purchased here. Have you read Excellence Without a Soul: Does Liberal Education Have a Future?? I skimmed through it several years ago. If I remember correctly, he was pushing back against the ideas like those advocated in Dr. Mearsheimer talk at the University of Chicago. P.S. The comments need blockquotes! “It is not simply to be cognizant of the truth but to be assimilated into it. … [S]apiential theology sought to gain the knowledge of God by which people might live in the truth.” And even farther back, the book of James wrestles with knowing and doing. James is closely tied to the genre of OT wisdom literature.